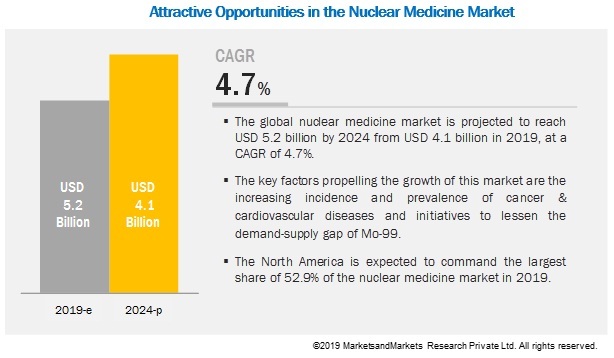 [213 Pages Report] The nuclear medicine/ radiopharmaceuticals market is expected to grow from $3.95 billion in 2018 to $5.26 billion by 2023, at a CAGR of 5.9% from 2018 to 2023. Increasing incidence & prevalence of cancer and cardiovascular diseases and initiatives to lessen the demand-supply gap of Mo-99 are the key factors propelling the growth of this market. The market is expanding with the emergence of new applications and discovery of new medical isotopes. Nuclear Medicine is used in many diagnostic and therapeutic applications such as oncology, cardiology, neurology and other applications. The base year considered for the study is 2017, and the forecast has been provided for the period between 2018 and 2023. The rising incidence and prevalence of cancer and cardiovascular diseases (CVD) will be the key factor supporting market growth. Most cases can be prevented through early detection and treatment; nuclear medicine plays a significant role in these areas. According to GLOBOCAN 2012, the global incidence of cancer was 14.1 million (excluding non-melanoma skin cancer) in 2012. In addition, annually ~19.3 million new cases are expected to be detected by 2025. According to the WHO, globally, 17.5 million individuals died from CVD in 2012, representing 31% of overall deaths globally. This figure is expected to reach 23.3 million by 2030. By driving the overall use and need for nuclear medicine, the rising incidence and prevalence are expected to directly affect market growth. The following are the major objectives of the Nuclear Medicine Market Research study. 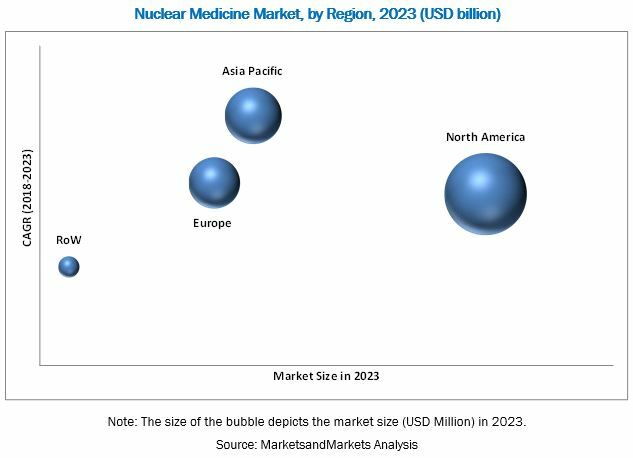 Key players considered in the analysis of the nuclear medicine market are Cardinal Health (US), GE Healthcare (US), Curium (France), Bayer (Germany), Lantheus Medical Imaging (US), Advanced Accelerator Applications (France), and Jubilant Life Sciences (India). In 2018, Curium signed an agreement to acquire Cyclopharma’s manufacturing and commercial operations in France. In 2016, The US Department of Energy’s (DOE) NNSA awarded USD 25.0 million in cooperative agreement funding to General Atomics to complete its project with Nordion and the University of Missouri Research Reactor Center (MURR). The Phase II funding aims to establish a new reliable supply of molybdenum 99 (Mo-99) using Low Enriched Uranium (LEU). In 2015, GE Healthcare partnered with SHINE Medical Technologies (US), a manufacturer of radioisotopes for nuclear medicine. The partnership was aimed at obtaining pharmaceutical-grade Tc-99m from GE Healthcare’s Drytec (Technetium Tc99m Generator) for the production of Sodium Pertechnetate for using Mo-99 produced by SHINE’s innovative process. SHINE is expected to begin commercial production in 2019 using the new process after getting an approval from the US FDA. What are new application areas which the nuclear medicine companies are exploring? The overall nuclear medicine market is expected to grow from USD 3.95 billion in 2018 to USD 5.26 billion by 2023, at a CAGR of 5.9% from 2018 to 2023. Increasing incidence & prevalence of cancer and cardiovascular diseases and initiatives to lessen the demand-supply gap of Mo-99 are the key factors propelling the growth of this market. Nuclear Medicine/Radiopharmaceuticals are drugs that contain radionuclide-emitting ionizing radiation, used in nuclear imaging to diagnosis and treat diseases. The nuclear medicine uses radiation to provide diagnostic information about the functioning of a specific organ. Therapy radioisotopes are used to treat medical conditions, especially cancer, using radiation to weaken or destroy particular targeted cells. Based on type, the market is segmented into diagnostic radiopharmaceuticals and therapeutic radiopharmaceuticals. The diagnostic radiopharmaceuticals have been segmented into SPECT and PET radiopharmaceuticals. PET radiopharmaceuticals have been further segmented into F-18, Ru-82, and other PET isotopes. In 2017, the F-18 segment accounted for the largest share of the nuclear medicine PET radiopharmaceuticals market. F-18 is the most commonly used PET radioisotope owing to its higher half-life (110 minutes) compared to other radioisotopes. F-18 is estimated to account for 98% of the total PET radioisotopes market. The market in APAC is expected to grow at the highest CAGR during the forecast period. The major factors driving the growth of this regional segment include research initiatives in Japan and the rising installations of PET scanners in India and China. FDG F-18 is used in diagnostic PET imaging to evaluate areas of abnormal glucose metabolism. FDG-PET is more accurate and preferred to conventional imaging for diagnosing various malignancies from staging and restaging to detecting radionecrosis from viable tumors. FDG F-18 is approved for oncology applications such as staging of cervical, esophageal, gastric, and non-small-cell lung cancer as well as for head and neck carcinomas and lymphoma. PET radioisotopes are used for diagnosing CVDs. FDG F-18 and Ru-82 are used for diagnosing cardiac disorders such as CAD and left ventricular dysfunction. Ru-82 isotope is a cost-effective alternative to the Tc-99m SPECT isotope, with a preference for Ru-82 in cardiology increasing due to its use in diagnosing CAD. Moreover, Ru-82 offers several advantages over SPECT imaging radioisotopes for the accurate detection of CAD and is thus preferred over Tl-201 SPECT radioisotope. The increasing incidence of AD, epilepsy, and Parkinson’s disease is the major driver for the growth of the PET neurology market. FDG F-18 is majorly used for imaging cerebral glucose consumption. Hence, use of FDG F-18 is increasing for neurology, neurosurgery, and psychiatry applications. Sensors play an important role in the durability of medical devices and healthcare systems. Nuclear medicines are widely used in applications such as sensing end position, medical mobility equipment, hospital beds, lift chair position, power wheelchair, and mobility scooter. In such applications, nuclear medicines are required to provide enhanced reliability and high sensitivity to ensure patient or user safety. What are the upcoming industry applications for nuclear medicines? The short half-life of the radioisotopes is a major factor restraining the growth of the market. The expiry of a radiopharmaceutical primarily depends on the half-life of the radioisotope and content of the radionuclide. For example, the radioactivity of F-18 in PET decreases if not used within 110 minutes, while the radioactivity of C-11 decreases within 20 minutes. In SPECT diagnosis, the radioactivity of Tc- 99m is reduced after six hours, while I-123 and In-111 isotopes should be utilized within 13 hours and 67 hours, respectively. Non-utilization of radioisotopes within the prescribed shelf-life causes radiation and chemical decomposition, reducing radiochemical purity to an unacceptable form, which may prove fatal during diagnosis and therapy. 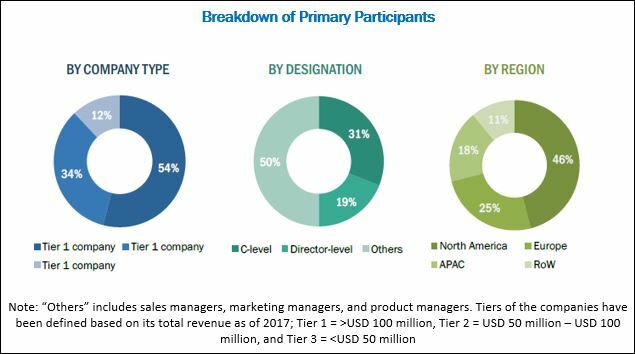 Key players in the nuclear medicine market include Cardinal Health (US), GE Healthcare (US), Curium (France), Bayer (Germany), Lantheus Medical Imaging (US), Advanced Accelerator Applications (France), and Jubilant Life Sciences (India). These players are increasingly undertaking mergers and acquisitions, and product launches to develop and introduce new technologies and products in the market.